It is a widespread assumption that motions of humans and animals are carried out in an optimal way due to evolution, learning and training. The behavior under certain circumstances such as pain or fatigue can also be considered as the result of an optimization process. 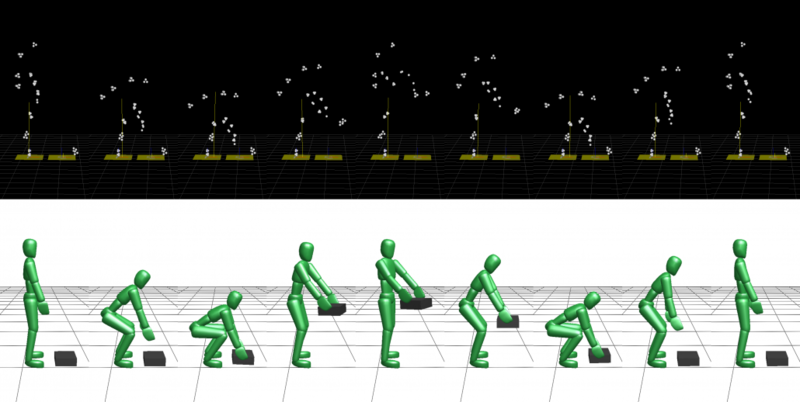 Since most of these optimizations are unintentional and unconscious, the specific optimization criteria underlying a motion are usually not known. In order to identify suitable optimality criteria for describing the lifting motions of people with and without low-back pain, we performed inverse optimal control computations. For this purpose we carried out a biomechanical study on people with and without low-back pain performing different lifting techniques including stoop- and squat-lifts and lifts with body rotation as well as different range of motion trials. 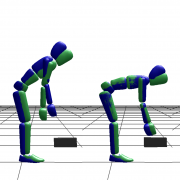 The motions were recorded using a motion capture system. We created mathematical models of the subjects with virtual markers attached. We fitted marker positions and the orientation of grouped markers of all recordings and subjects to obtain joint angle trajectories which we analyzed an compared. We observed that the range of motion of the subjects was very individual. We also had subjects without low-back pain with a more limited range of motion than subjects with low-back pain. In addition, we found that performing squats tend to be more difficult for people with low-back pain. We set up an inverse optimal control problem to test a set of optimality criteria including minimization of joint torque, mechanical work, joint velocity and joint angle. We performed the computations for the stoop-lift of four different subjects and compared the results. We could reproduce the movements quite well for the subjects. Most deviation was observed for the arms and the head. We got similar results regarding the optimality criteria for all tested subjects, so there could be no significant difference identified between subjects with and without low-back pain performing stoop-lifts. We plan to test further optimality criteria and lifting techniques and present the results soon.